C.N.A Risk Management provides a comprehensive range of Security Consultancy and Management services for the Licensing Trade. We pride ourselves on providing the best value, bespoke security and Management advice to meet individual requirements and budgets whilst complying with the relevant Standards and Regulations. The consultancy was born out of an increasing need for high calibre independent consultancy services, at that time an innovative approach to individual security problems. C.N.A Risk Management is uniquely placed to meet the demands of this specialised market place. C.N.A Risk Management team covers the spectrum of security and management expertise from Events / Fire risk Assessments, management services and risk management. Our clients may be assured that our solutions are designed to be practical, cost effective and confidential. 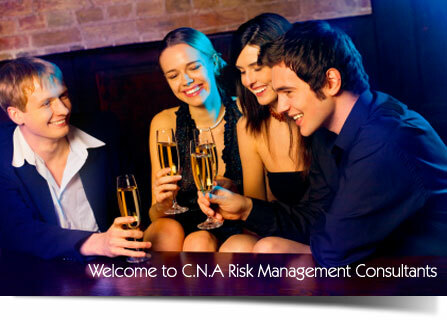 Our team at CNA risk management has a wealth of experience and professional expertise. Carl spent many years as an operational Detective on both the local and National police departments, with particular expertise within the Drugs, Surveillance Intelligence and Financial fields. His latter years service with the West Midlands Police was spent in Birmingham City Centre where he was responsible for the setting up the Arcadian Pub watch and Radio Link, He worked very closely within the licensing trade in enforcing and advising upon the latest legislation in and around the Arcadian Centre, China Quarter, Southside and other parts of Birmingham City Centre. Mr Moore retired in June 2006 and set up C.N.A Risk Management. Our company enjoys an excellent relationship with the local Police Service in Walsall, Birmingham, West Bromwich, Worcester and Stratford.